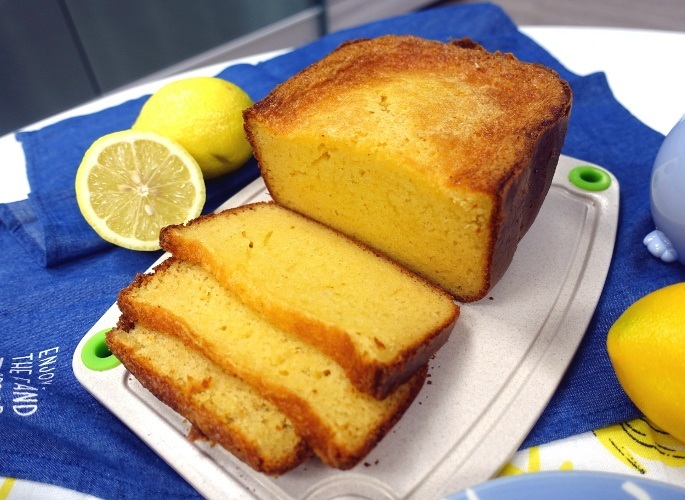 Use SONG-CHO BREAD MAKER (SC-BK06A) to bake a simple lemon cake (recipe based on manual). The cake is more of a dense texture. Pour the ingredients into the bread barrel in sequence (important). Butter >> Sugar >> Eggs >> Self-Rising Flour >> Flavouring Essence >> Lemon Juice >> Yeast (yeast to be poured on top of the dry flour on one side and must not come into contact with lemon juice directly). Press MENU button till 7 (CAKE) and press START button. Takes 2 hours 50 minutes to complete the entire process. Half-way through the mixing, use a spatula to scrap off the flour that is stuck to the side of the bread barrel. This will ensure the flour is mix well. See image of cake without mixing it manually. The Bread Maker will beep once it is done. Open the lid, bring up the barrel holder (careful, it’s hot!) with a mitten or cloth. Hold the holder and remove the barrel by twisting it at an anti-clockwise direction. While the cake is still hot, remove it from the barrel by holding the barrel upside down using a cloth or mitten and shaking it (do not use sharp object to try to get it out). Slice the cake once it has cooled down and enjoy the fresh bake. Note: if the mixing blade is stuck into the cake, remove it before cutting the cake. 在面包机搅拌材料的同时, 用抹刀把沾在面包桶旁的面粉轻轻刮下, 协助搅拌. 这可确保材料能搅拌均匀. 看没有协助搅拌的蛋糕成品图片. 程序完成后, 打开盖子. 利用抹布将面包桶的手柄拉上 (小心烫), 再将面包桶逆时钟取出. 在蛋糕还热时从桶内取出 (用摇晃方式, 不要用利器或其他物件将它挖出).